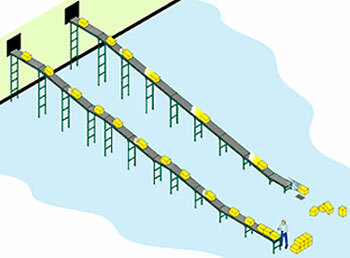 Infeed and discharge elevations: These are the fundamental heights of the conveyor at the top (where product enters) and bottom (where the product stops). The steeper this slope, the faster product can flow. Conveyor type (roller or skatewheel): Items flow faster on skatewheel than they do on gravity roller conveyors. However, rollers are better suited for poor loads and more types of loads than skatewheels. Bearings: Are they grease-packed or clean? Grease packed bearings tend to roll slower. Load weight: Specifying conveyors so that they fit the weight of your load promotes good product flow. Rule of thumb is that the same type of load, on the same conveyor, at the same slope, will move faster when it’s heavier. Some very light loads will not move at all. Some very heavy loads may move too fast. A tote that weighs 10 pounds requires more slope than one that weighs 50 pounds. Line length: Cartons may accelerate on longer runs, and move faster than you’d like. Load characteristics: If the load is firm and smooth, it flows better. Difficult loads tend to require rollers, which by nature move slower. Very difficult loads will be harder to convey. A firm carton conveys differently than a tote of the same weight, placed on the same slope. The differences are more pronounced when load bottoms aren’t consistent, rigid or easy to convey. Bags or other loads with irregular conveying surface will be harder to move than any smooth or rigid surface. The “acceleration effect”: The rate of flow for conveyed boxes is also affected by the “acceleration effect” of a spinning roller or wheel that’s still moving after a preceding box has rolled across it. Flow design: Boxes and other loads move faster in straight lines. Adding curves or turns reduces flow. What if it’s too fast? If your conveyor flows a little too well, you can adjust the pitch or use retarding plates to manage roll speeds. You can also add end stops for managing the end of the line. What if it’s too slow? Increase the slope to allow proper product flow. 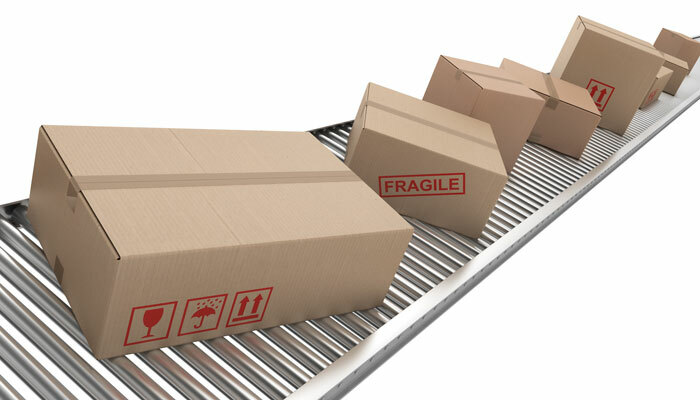 Always test product flow and slope before you begin using the conveyor. It’s relatively easy to adjust pitch before the conveyor goes into operation and you’re dealing with live loads. Be sure you know the largest/smallest, lightest/heaviest load you’ll be conveying. This is a common tactic to save energy and deliver products to the correct point. Commonly called a flow system, it can affect the needed slope since the powered sections are propelling the load as it transitions to gravity units.